Two teens from Seattle, Washington, 19 year old Bailey Meola and Sydney Schumacher, have been missing since April 25, 2015 in Nepal. According to the family, an anthropologist reported seeing the two on April 24, just one day before a 7.8 earthquake hit Nepal and aftershocks destroyed nearby villages. The two girls had been trekking the Langtang Valley trail; however, on Tuesday, the family received news that the girls are not in the village, Kyanjin Gumba, where it had been reported that there were no known survivors. The death toll from the earthquake in Nepal has risen to more than 4,600 — and many more people are unaccounted for, including two teens from Seattle. The Meola and Schumacher families are staying optimistic that they will find their 19-year-old daughters, Bailey Meola and Sydney Schumacher. The two girls had been trekking the Langtang trail. On Tuesday, they got news that the girls are not in the village, Kyanjin Gumba, where there are known survivors. The teens had just graduated from Garfield High School and were taking an around-the-world trip, with a stop in Nepal. 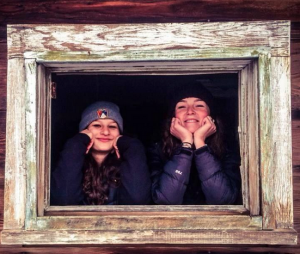 Seattle teenage trekkers among the missing in Nepal. 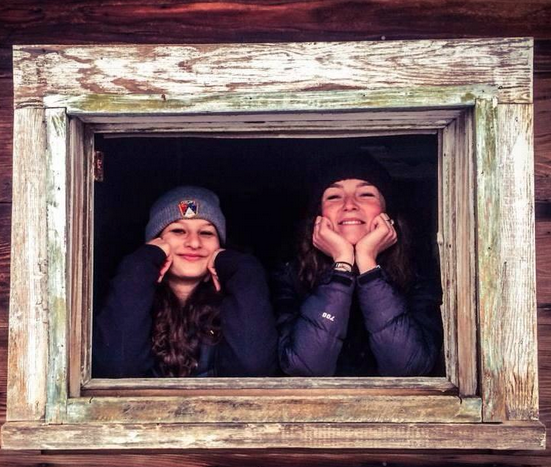 Both young women are described as experienced hikers, who began exploring the outdoors when they were toddlers. The teens are trained in first aid and CPR, their parents said. Both girls are traveling around the world after graduating from Seattle’s Garfield High School in 2014. Meola started her trip in Thailand earlier this year, also visiting Singapore, Cambodia, and Laos. She wanted to take a “gap year” and explore the world before heading to college, her parents said. The families have turned to social media for help, hoping for word of the girls’ safety through Twitter or other forums. They’ve been using a Facebook page for people missing in the Langtang Valley, along with a Google spreadsheet. Following the 7.8 magnitude earthquake in Nepal, a deadly avalanche was caught on video at the Mt. Everest as it swept through an unsuspecting base camp. The deadly avalanche that swept through the Mt. Everest base camp after Saturday’s massive earthquake in Nepal was caught on video by a German climber. “The ground is shaking,” someone shouts as the footage begins. Moments later, climbers in the distance begin to run before the avalanche itself is visible. Then, within seconds, the camera fills with a fast-moving cloud, signaling the advance of the avalanche. UPDATE I: Climbers trapped on Mount Everest ‘are getting desperate’. Helicopter teams began evacuating critically injured climbers at Mount Everest’s base camp Sunday morning, but the effort came to an abrupt halt when a significant new aftershock triggered more avalanches and fears of additional casualties at the world’s highest peak. media posts. Ropes and other equipment left in place to help them descend had been swept away in Saturday’s avalanche. A 7.8 magnitude earthquake has stuck Nepal in an area between the capital, Kathmandu, and the city of Pokhara. The government is reporting that nearly 700 people have died from the massive earthquake; however, the numbers are sadly expected top rise. The earthquake is the worst one in Nepal in 81 years as it toppling a 19th-century tower in the capital Kathmandu and touching off a deadly avalanche on Mount Everest. Nepali Information Minister Minendra Rijal said there had been “massive damage” at the epicentre, from where little information is emerging. UPDATE I: At Least 1,457 Dead After Massive Earthquake Strikes Nepal. A massive earthquake near the capital of Nepal killed at least 1,457 people today as it collapsed temples and triggered an avalanche on Mt. Everest. The magnitude-7.8 quake hit about 50 miles northwest of Kathmandu just before noon local time, according to the U.S. Geological Survey. The death toll, estimated by the Nepalese Army, was expected to rise, said officials. Another 1,055 were injured, said the country’s finance minister, Ram Sharan Mahat. It’s the worst earthquake in Nepal in over 80 years, according to the Associated Press. UPDATE II: Devastating Nepal quake kills over 1,000, some in Everest avalanche. A powerful earthquake struck Nepal and sent tremors through northern India on Saturday, killing more than 1,000 people, toppling a 19th-century tower in the capital Kathmandu and touching off a deadly avalanche on Mount Everest. There were reports of devastation in outlying, isolated mountainous areas after the midday quake of magnitude 7.9, Nepal’s worst in 81 years, centered 50 miles (80 km) east of the second city, Pokhara. As fears grew of a humanitarian disaster in the impoverished Himalayan nation of 28 million, an overwhelmed government appealed for foreign help. India was first to respond by sending in military aircraft with medical equipment and relief teams. A police official said the death toll in Nepal alone had reached 1,130, more than half of them in the Kathmandu Valley. A further 36 fatalities were reported in northern India, 12 in Chinese Tibet and four in Bangladesh. UPDATE III: Everest climbers jolted; at least 8 dead at base camp. A powerful earthquake in Nepal sparked a deadly avalanche on Mount Everest on Saturday, killing at least eight people at the base camp. The base camp is where journalists, climbers and their families gather and get news to the world about developments at Everest, the world’s highest mountain above sea level. At least one team of climbers on Everest appears to be safe after a few hours of anguish in which the expedition leader asked for prayers on social media in the wake of the massive earthquake in Nepal. UPDATE IV: The Guardian – Nepal earthquake: death toll exceeds a thousand – live updates. UPDATE V: More than 1,900 killed by 7.8-magnitude quake in Nepal. At nightfall, Nepal’s capital became a tent city, as thousands of residents displaced by Saturday’s devastating earthquake stayed in their dark gardens and out on the cracked streets and lanes, afraid to go back inside because of waves of aftershocks, including a powerful jolt Sunday that the U.S. Geological Survey said measured 6.7 magnitude and which sent people fleeing for open ground and safety. It had been a pleasant Saturday morning, with families just sitting down to lunch and tourists thronging to Kathmandu’s Durbar Square when the temblor hit, a horrible rocking motion that seemed to go on without end. The quake was ultimately felt across South Asia — in Lahore, in New Delhi, in Dhaka. Snow avalanched down Mount Everest. Buildings fell, mud-joined huts collapsed. By the end of the night, more than 1,900 lay dead, Nepalese officials said, with countless more injured. UPDATE VI: Death toll from a devastating earthquake rose past 3,700. Rescue workers raced to reach remote rural villages in Nepal Monday as the official death toll from a devastating earthquake rose past 3,700 and threatened to climb. Nepal police said in a statement Monday that the country’s death toll had risen to 3,617 people. That number does not include the 18 people confirmed dead in an avalanche that swept through the Mount Everest base camp in the wake of the magnitude-7.8 earthquake. Another 61 people were killed in neighboring India. China reported that 20 people had died in Tibet. Reports received so far by the government and aid groups suggest that many communities perched on mountainsides are devastated or struggling to cope. Udav Prashad Timalsina, the top official for the Gorkha district, near the epicenter of Saturday’s quake, said he was in desperate need of help. “There are people who are not getting food and shelter. I’ve had reports of villages where 70 percent of the houses have been destroyed,” he said. Nepal quake: Death toll passes 3,700 amid fears of devastation in rural areas. The death toll in Nepal from the earthquake that struck two days ago has risen to 3,726, Nepalese police spokesman Kamal Singh Bam said Monday. As the death toll from Nepal’s worst earthquake in decades surged past 3,400 on Monday, big questions remained about the scale of the devastation in rural areas. The destruction in Kathmandu, the capital, is stark: Revered temples reduced to rubble, people buried in the wreckage of their homes, hospitals short on medical supplies overflowing with patients. Serious damage is also reported in villages in the surrounding valley. 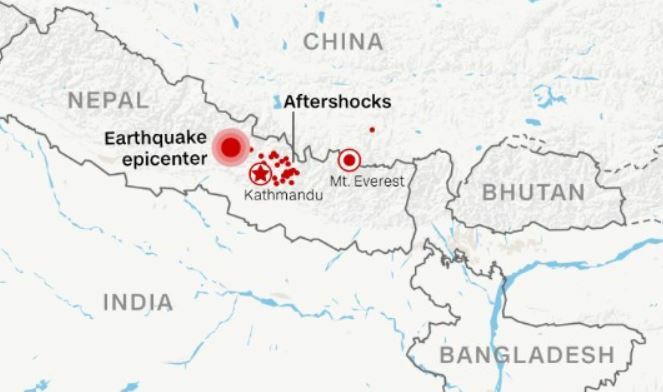 But farther out across Nepal’s rugged landscape — closer to the epicenter of the 7.8 magnitude quake that struck Saturday — the situation is worryingly murky. UPDATE VII: The official death toll from Saturday’s earthquake in Nepal has increased. The official death toll from Saturday’s earthquake in Nepal has increased. Nepal police late Wednesday reported 5,045 deaths had occurred in Nepal. It also said more than 10,100 people had been injured and 7,400 of them remained hospitalized. In addition, 19 people were killed on Mount Everest, 61 people were killed in India and China reported 25 deaths in Tibet.